The Czech striker was given another opportunity by Craig Levein to get off the mark in a maroon jersey since joining from Teplice in January. However, after another underwhelming 45 minutes in Hamilton, the wait for a goal rumbles on. Vanecek started through the middle and was flanked by Jake Mulraney and Callum Morrison, both players also struggled to impose themselves in what was a lacklustre opening from the visitors across the board. Vanecek did come agonisingly close to bulging the net just minutes before the half-time interval when his close-range effort came back off the crossbar. However, that was to be his last taste of the action as he failed to reappear for the second half. Confidence is key, something Vanecek is bereft of since arriving in the Capital. Hearts threw caution to the wind in the second half with Levein electing to put on Aidan Keena and Craig Wighton – to support Ikpeazu up top – as the visitors sought an equaliser. 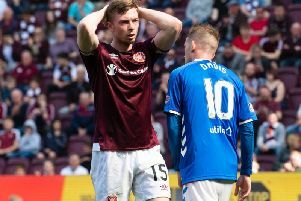 But despite having so many forward-thinking players on the pitch at the one time – Sean Clare, Arnaud Djoum and Morrison were the other attacking outlets – Hearts failed to test Gary Woods, who couldn’t have envisaged his opponents’ lack of firepower prior to kick off. This must be a huge concern for the Hearts head coach given Hamilton’s well-documented defensive vulnerabilities, not to mention the Gorgie side's high hopes of a successful end to the season. Hearts are now entering a make or break point in their season with four colossal games to come after the international break. Despite the defeat to Hamilton, both Aberdeen and Kilmarnock, third and fourth respectively, only gained a point in the race for a European spot. That is the one crumb of comfort Hearts can take. However, with city rivals Hibs now breathing down their necks, things are really hotting up in the top six with just three Premiership matches to play before the split. With the visit of Aberdeen and Hibs and a trip to Ibrox beckoning in the next three weeks, Hearts must rediscover their mojo and start picking up points again or run the risk of their season petering out. There’s also the small matter of a Scottish Cup semi-final against Inverness to negotiate next month. The Jambos won’t want to go into that match at Hampden in poor form. The international break may just have come at a good time for Levein and his players. Only time will tell.